Trust me, this is an interesting place. Wise words indeed from author Bill Bryson of his travels Down Under, where 'people are immensely likable — cheerful, extroverted, quick-witted, and unfailingly obliging'. Pack your swag! 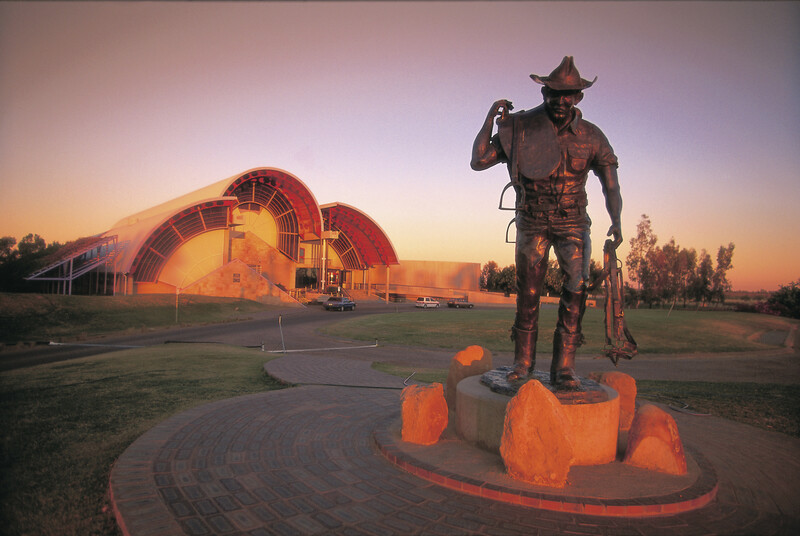 There's no better time to heed his words than on a winter road trip through Outback Queensland. Here, all roads lead to out-of-this world adventures, new friendships (#matesforlife) and money-can't-buy experiences. 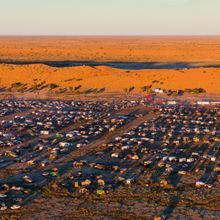 Think award-winning Outback events from the world's most remote rock concert on the edge of the Simpson Desert (Birdsville Big Red Bash: 10-12 July), to a film festival that gives Cannes a run for its money (Vision Splendid Outback Film Festival: 30 June - 7 July) or a horse race that leaves the Melbourne Cup in its dust (Birdsville Races: 31 August - 1 September). 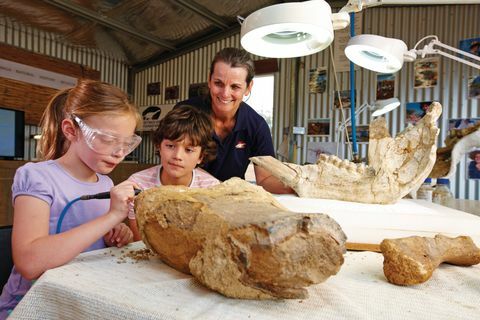 Not forgetting, quintessential Outback hurrahs, laugh-out-loud hilarities and an opportunity to time travel (on a dino dig courtesy Australian Age of Dinosaurs or kicking back at a pub with no town). Racing has always been part of the Aussie psyche, particularly cars and horses. In Outback Queensland, however, this extends to guinea pigs, chickens, dunnies, yabbies, goats, sheep, lawn mowers and, big favourite, camels. 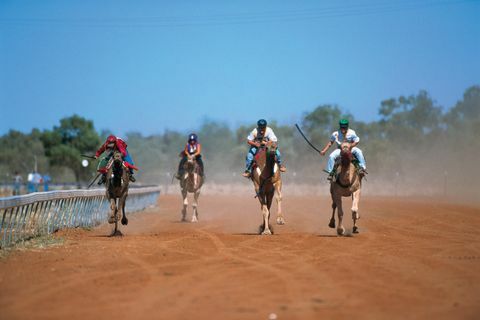 Winter is camel racing carnival in Outback Queensland! 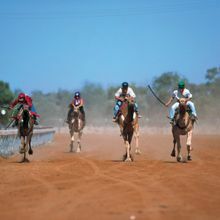 Cheer on humped heroes as Boulia Camel Races (20-22 July), Australia's longest-running, clocks up 22 years, a weekend after Bedourie Camel and Pig Races and Camp Oven Cook-off (14 July). *Psst: For extra grunt, Boulia Camel Races features the 'Great Australian Ride-on Lawn Mower Race'. 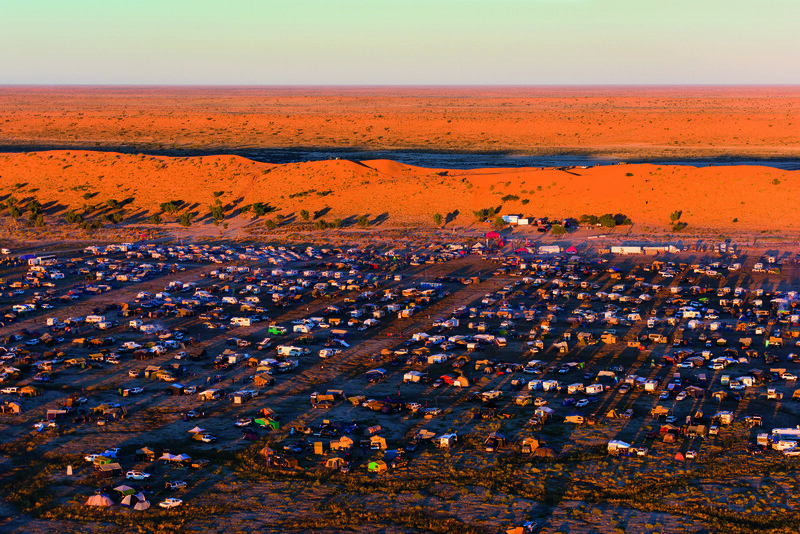 Horse racing is also big business way out West, with Birdsville Races this year celebrating 136 years, transforming the iconic one-pub town from a population of 100 to a party of 10,000. 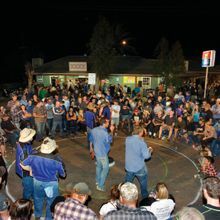 What's more, for the past 20 years, a street race like no other, Windorah International Yabby Races, has wow-ed crowds each Wednesday night before Birdsville Races on a circuit outside Windorah's Western Star Hotel. But for the ultimate flutter, make tracks to the Royal Carrangarra Hotel in Tambo to punt on Ben's Chicken Races, where a 10-strong field of chooks sporting names like Frankenhen and Chicken Dinner chase a remote-controlled car stuffed with worms. Racing chickens, by the way, aren't on the menu. Instead, these pampered hens are tucked in bed before dark, with a special 'Bawk Bawk' beer created in their honour (exclusive to the hotel). Looking for something to really crow about? Bag yourself a Tambo teddy. The brainchild business of three local women (who started making the bears in 1992 to help in times of hardship like drought or a crash in wool prices), now has global reach, with Tambo Teddies drawing Royal admirers. Indeed, the cuddly Outback Queensland ambassadors were recently shipped to London as companions for Prince George and Princess Charlotte. Aussies have long been enamoured with big things. Drive anywhere. Soon enough you'll spot a gargantuan landmark, from the Big Pineapple to Big Bogan (look for the latter over the border in NSW). Outback Queensland has its own swathe of big things – most of them thankfully not man-made – from Australia's biggest dinosaur, called Cooper (a 95 million-year-old titanosaur, standing 6.5 metres high and spanning 30 metres in length), housed at Eromanga Natural History Museum in Australia's farthest-flung town from the sea, to a prehistoric fish called Wanda (Australia's largest fossilised fish) at Kronosaurus Korner in Richmond; a 10-storey high sand dune, Big Red, the Big Daddy of the Simpson Desert (aka the biggest sand dune desert on the planet) and back drop to the world's most remote rock concert, Birdsville Big Red Bash; and, let's face it, a sky so big it defies description. Man-made big things also abound, including Augathella's Big Meat Ant; the Big Ram near Blackall Woolscour (Australia's last remaining steam operated wool washing plant); Emerald's Big Easel (a 25-metre tribute to Van Gogh's sunflowers); the town of Banana's namesake (not a banana, but yellow-coloured Banana the Bullock, standing proud in the centre of town); and the Big Stockman taking pride of place outside Australian Stockman's Hall of Fame in Longreach. Winton, meanwhile, is home to man-made things worth marvelling at. Check out Arno's Wall (the lifetime's handiwork of the late Arno Grotjahn), which stands two metres high and 70 metres long, dotted with everything from lawnmower parts to boat propellers, toilet bowls, complete motorbikes, vintage typewriters and sewing machines. The town is also home to the world's only Musical Fence, used by Grammy Award winning Australian singer-songwriter Gotye to create the bassline for his multi-instrumental masterpiece Eyes Wide Open. 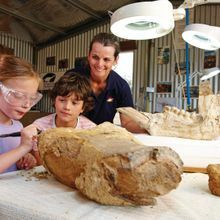 Guaranteed: everyone will want to know your name in Outback Queensland's iconic waterholes, as much famed for hospitality as cold beer. Pull up a seat at Walkabout Creek Hotel in McKinlay, immortalised as Mick Dundee's pub in cult Crocodile Dundee films. Legendary, yes, but otherwise a watering hole considered the new kid on the Outback block, dating back to just 1990. Loyal stalwart, the Nindigully Pub, meanwhile, goes down in history as Queensland's longest continually licensed establishment, built in 1864, and making a cameo appearance in the film, Paperback Hero, starring Hugh Jackman and Claudia Karvan. But for a pub closest to the movie action, Middleton Hotel – formerly a Cobb and Co changing station (and the last of its kind still standing) halfway between Winton and Boulia – is the place to be. Built in 1876 by a farrier named Wiggins, it stands proud as possibly Queensland's most isolated pub, 200km north-east of Boulia and 164km west of Winton. 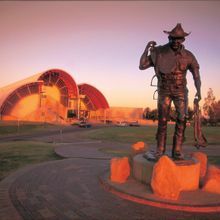 Notably, within Cooee of a movie set that doubles as the fictional outback Australian mining town made famous in the film Goldstone, Ivan Sven's follow-up to Mystery Road. Middleton Hotel publican Lester Cain (one of Middleton's population of just three, at last count) is still waiting for his movie debut; a true Outback character with 101 stories and more to tell, not least being his prowess at camel wrangling and opal fossicking. There's beer on tap, emergency fuel and, for those wanting to pull up stumps, even a 'Hilton Hotel' opposite the old pub. That's Hilton, Outback-style! A free overnight camp, marked with the welcome sign: “Vacancy, no air-conditioning, no TV, no pool, no charge”. Travellers can wash the dust off at Middleton Hotel's bathroom facilities, including shower, for a small donation to the Royal Flying Doctor Service. History buffs, listen up! There's arguably no better place to down a coldie than Winton's North Gregory Hotel, which stakes its claims as the first place Banjo Paterson publicly performed Waltzing Matilda, back in 1895. Close to half a century later, in 1945, during World War II, Lyndon B. Johnson (before he was US President) checked in to the hotel when his Flying Fortress aircraft was forced to land with mechanical problems at nearby Carisbrooke Station. But don't just raise a glass to history, step back in time with a visit to Winton's new Waltzing Matilda Centre, a $23 million state-of-the-art facility, re-opened in April 2018, literally rising from the ashes after being gutted by fire in 2015. Barcaldine's Shakespeare Hotel overlooks the Tree of Knowledge, a ghost-gum regarded as the birthplace of the Australian Labor Party, while on the road between Thargomindah and Quilpie, you're unlikely to come across another pub like South Western Hotel (best known as Toompine Pub). 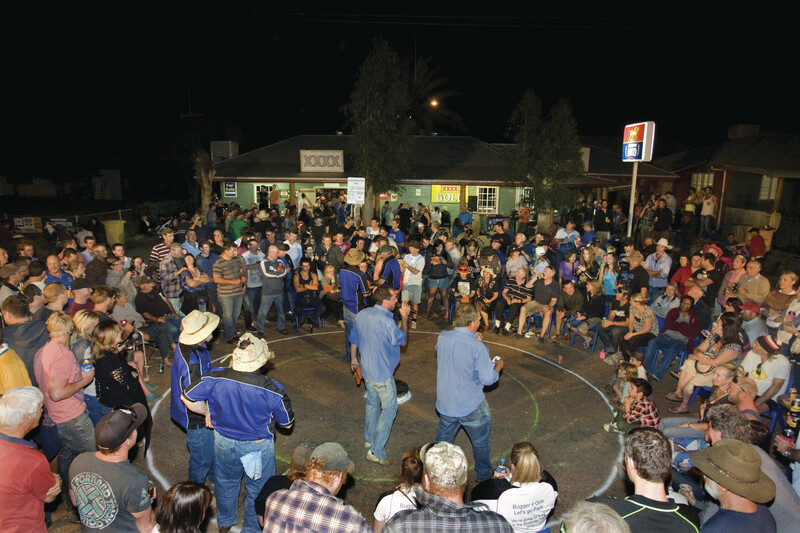 You may have heard of The Pub With No Beer, immortalised by the Slim Dusty song, but Toompine Pub is The Pub Without A Town. All that remains of a once thriving pioneer community serviced by Cobb & Co coaches is the Toompine Pub (circa 1893). Last but not least, no trip to Outback Queensland is complete without pulling up at Birdsville Hotel (circa 1884), plonked next to an airstrip on the edge of the Simpson Desert. Expect to rub shoulders with Aussie rock royalty during Birdsville Big Red Bash, this year lining up 13 of Australia's biggest stars including revered Jesus Christ Superstar trio – John Farnham, Kate Ceberano and Jon Stevens. Now in its sixth year – and voted 'Australia's favourite event' at the 2017 Australian Event Awards – the world's most remote rock concert conveniently falls during July school holidays. Hallelujah indeed! *Hot tip: make tracks to Eulo's Artesian Mud Baths for a luxe soak Outback-style. The detox comes with an added bonus: unlike New Zealand's famed mineral mud baths, Eulo's mud is sulphur-and stink-free! You beauty!